Richthofen castle was built by the uncle and Godfather of the famed World War I flying ace - Baron Manfred von Richthofen (a.k.a. The Red Baron).The castle was designed after the von Richthofen castle in Germany and was completed around 1887. We only live a few blocks from the castle and recently saw an advertisement for sale - $4,000,000 - in the basement it has the Red Baron Pub - a complete replica of a WWI pub with manikins in real uniforms from soldiers, nurses, etc.... pretty cool. I grew up a few blocks from Richthofen Castle, and spent most of my childhood convinced it was inhabited by vampires. I found your website while telling a friend about the castle, and was disappointed that you didn't have more information about one of the most interesting castles in the United States. Richthofen Castle was built by Baron Walter von Richthofen, the uncle and godfather of the famed "Red Baron." Richthofen Castle was begun in 1883 and completed in 1887, and modeled on the original Richthofen Castle in Germany. It is located in Montclair, a Denver neighborhood, which Baron von Richthofen promoted as "a fount of health and prosperity, and as a model community with enlightened planning and sophisticated architecture. Located immediately around the Castle are the Baron's mistress' house and his sanitarium/dairy. In 1910 it was extensively remodeled by Edwin Hendrie who had purchased it to be his home, and his "modernization" destroyed some of the castle aesthetic, but much remains. J.J.B. Benedict designed the south wing in 1924. The 35-room castle features an oak-panelled entry hall, hand-tooled leather walls, and parquet-floored music room that seats 150. The gatehouse to the east has been converted to a separate residence. At this website, you can find various outside view of the Castle before and after it's remodeling. http://memory.loc.gov/ammem/award97/codhtml/hawpSubjects286.html . Most interestingly, in 1911, Richthofen Castle was the site of one of the most sensational murders in Denver history, of Charles Patterson by his wife, Gertrude. Charles Patterson was shot twice in the back by his wife Gertrude, who claimed self-defense, that he had beaten her. More about this can be found here: http://www.dvmen.org/dv-141.htm Recently, a law professor at Denver University, Robert Hardaway, wrote an account of the case in his book, entitled "Alienation of Affection". 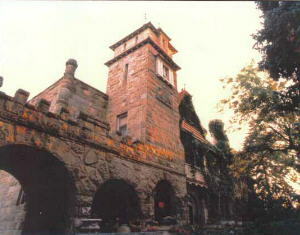 Richthofen Castle is located at 7020 E. 12th Ave. Denver, CO. I read somewhere that it was occasionally open to the public, but I remember there being an extremely sturdy fence and guard dogs, as well as "No Trespassing" signs, so I tend to doubt the veracity of that report. Since it is now located inside the city, it is possible to get glipses of it driving past, but the fence and vegetation can obscure the view. There is what seems to be a full scale version of the WWI flying Ace, Baron von Richthofen's, Fokker DR-1 Tri-plane, in German Red complete with Iron Cross markings, sitting in the front yard (got two nice pictures of that with the castle in the background). The castle grounds are walled and entry barred by gates, stone walls, fenced hedges, and in some places barbed wire. Pictures in winter make it look ominous - definitely German!